HP LaserJet 1200n printer is one among the other HP products to hit the stores recently. The device has a simple design with the more curvy finish and more elegance than its predecessors ranging in these series. It comes in cream/off-white colour. 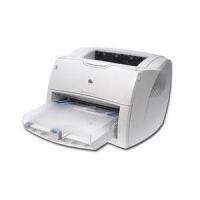 The HP LaserJet 1200n printer is small and compact. It is easy to use as a personal or small office laser printer. This 18.3 lbs device measures 19.2 x 16.3 x 9.9 inches and is capable of producing 15 pages per minute having a maximum resolution of 1,200 dpi. HP LaserJet 1200n printer has the ability to handle various media types such as cards, envelopes, plain paper and transparencies. The paper handling capacity of LaserJet 1200n is up to 260 sheets of paper. The device has a network print server option which connects the printer to all the computers available over a network. HP LaserJet 1200n printers have many features but the greatest among all of them is the fast ethernet connection allowing for networking options. The maximum RAM installed on this device is 16 MB which is upgradable up to 72 MB. HP LaserJet 1200n printer supports a wide range of media types and it's fast ethernet connectivity also add to its major advantage. The device comes with a single colour HP LaserJet 1200n toner cartridge which increases the running cost of the printer, making the consumer to think twice before going for it. How to get rid of toner smears appearing on the printouts? Printing issues are very common for any laserjet printer and so do their solutions. It is normal that after some time the printers start showing some print quality issues like smears, smudges, blanks or ink spots etc. These things can either be the result of low level or faulty HP LaserJet 1200n toner cartridge, or poor quality or damaged sheets or may be blocked printheads. However, should not worry about these issues as they can be resolved easily without the assistance of any professional. If toner smears appear on the leading edge of the printout, it might be possible that the input sheets or the media guides are dirty. Wipe the media guides with a dry, lint-free cloth. To learn more about the media guides or understand the printer’s parts, check the ‘Identifying the printer’s components’ and ‘Cleaning the Printer’ sections of the user manual of the printer. Check the media type and quality. Make sure you are using the right kind of sheets and you have placed the sheets properly in the input tray so that the prints come on the printable side. Try installing a new HP LaserJet 1200n toner cartridge. If the problem wasn’t caused by the print media, it might be the issue of a faulty toner cartridge. Replace the HP LaserJet 1200n toner cartridge and try making prints. It might be possible that the temperature of the fuser is too low. Access the printer properties and select the right media. Q. Does the HP LaserJet 1200n printer support colour printing? A. This printer does not support colour printing. It only supports monochrome printing. We have HP LaserJet 1200n toner cartridges of two different capacities available on our website. They are HP15X ( C7115X ) and HP15A ( C7115A). Q. Is automatic duplex printing supported by the HP LaserJet 1200n printer? A. Unfortunately, this printer does not support automatic duplex printing. Q. I recently ordered a pack of HP LaserJet 1200n toner cartridges? How can I track my order? A. When you placed the order for the cartridges, you would have gotten a unique order ID with which you can track your order with our courier company. Q. Do you sell any types of media or paper supported by the HP LaserJet 1200n printer on your website? Q. Are there any special offers applicable on the purchase of the HP LaserJet 1200n toner cartridges? A. Yes, if you are a first time user of our website, you can apply the coupon code D10 at checkout to get a 10% discount on our already affordable price for HP LaserJet 1200n toner cartridges. Also, for a limited time only, we have a Back to School sale. To avail the Back to School offer, use the coupon code BTS10 to get a 10% discount. The customer can use just one coupon code at a time. Q. What options do I have to make payment for HP LaserJet 1200n toner cartridges? A. You can make your payment using PayPal, Laser Card, American Express, MasterCard or Visa credit card, Maestro, Switch, Solo or Delta debit card for HP LaserJet 1200n toner cartridges. When you purchase items on this website, the payment is hosted by Sage Payments that ensure maximum security of your credit/debit card details. Q. What is the overall performance of HP LaserJet 1200n printer? A. The overall performance of this printer is better enough to use it for home or small office work purpose. Because of its high-speed printouts, good quality print results, fast ethernet connection, and automatic document feeder feature, it works great to serve all the purpose. Q. Please suggest me a printer for my personal use, which can save my time while printing documents? A. We would recommend you to look forward for HP LaserJet 1200n printer. The printer is a high-speed laser printer, which is simple in design and supports wide range of media types, such as cards, envelopes etc. The printer reduces the time required to print any document with its supporting features like fast ethernet connection and good printing speed. Q. How many paper trays are available in this printer? A. Only one paper tray is available in this printer. Q. What makes compatible HP LaserJet 1200n toner cartridges a better option than the original ones, for replacing expired toner cartridges? A. High-quality prints at low cost, makes compatible HP LaserJet toner cartridges a better option for replacing, over the original ones. If you replace your cartridges with the compatible ones, will get better quality results. Q. What is the cost for black colour compatible HP LaserJet 1200n toner cartridges available at your site? A. The compatible cartridges don’t cost much and are available at €28.95 (Inc. VAT). Q. Does the printer includes ePrint, eFax and AirPrint features? A. No, unfortunately the printer lacks mobile app features such as ePrint, eFax and AirPrint. Q. Do you offer urgent delivery service for HP LaserJet 1200n toner cartridges at Printerinkcartridges.ie? A. All our orders are delivered by Fastway Couriers. If your order is urgent and is received before 12 noon, then most probably the order will be dispatched on the same day and will be delivered within 1-2 days based on the Fastway Courier service. You can also call us at 048 30833221 for urgent deliveries. Q. What are the add-on accessories and products that come along with HP LaserJet 1200N? Do I need to buy anything separately beforehand? A. When you purchase HP LaserJet 1200N, it will have HP LaserJet 1200N toner cartridge (packed in a protective covering), how-to-start user guide, a separate user guide for electronic and software on CD Rom, HP Jetdirect 175x print server along with an attachment clip, print server module, USB cable, power cord, media input tray and priority media input tray packed together in one box. So, all the accessories required for printing are provided along with the printer, you need not buy anything separately. Q. Which are the best HP LaserJet 1200N toner cartridges available on your website? A. The compatible HP LaserJet 1200N toner cartridges available on our website are: HP C7115X (HP 15X) and HP C7115A (HP 15A). All the toner cartridges available on our website match the quality and performance of the original cartridges. Q. I am having problem in printing envelopes on my HP LaserJet 1200N. What can I do to resolve the issue? Please suggest. Thank you. A. Sure. Printing envelopes on laser printers turns out to be tricky sometimes. So, first of all please make sure the thickness and weight of the envelope you use is less than 20 lb. Next, check that the adhesive on the envelope is strong enough to stand the heat coming out from the fuse while performing printing. As this issue may cause the envelopes to come out already sealed. HP recommends to use envelopes that do not have self-adhesives susceptible to heat. Also, if you are printing the envelopes through the paper tray it might come out wrinkled. For the same, open the rear feed of your printer and let the envelopes print from that location. Hope this will solve your issue. Q. What is the resolution that HP LaserJet 1200n printer offers? A. The HP LaserJet 1200n printer works on monochrome laser technology and gives you HP reliable resolution of 1200 dpi which provides you with reduced banding and better line printing while connected to the network. Q. Does HP LaserJet 1200n printer has copier and scanner? A. Yes, you can upgrade the printer since it has expandability with scanner and copier. Q. What is the ratio to which one can reduce or enlarge the copies with HP LaserJet 1200n copier? A. The copier in HP LaserJet 1200n printer gives you an ideal reduce/enlarge ratio of 25-200%. Q. What is the average print volume that the HP LaserJet 1200n toner cartridges (HP C7115X (HP 15X)) offers? A. The HP C7115X (HP 15X) gives you an expected print volume of 3500 pages with 5% coverage of the page. Q. I am a budding entrepreneur. I just set up my office and have bought the HP LaserJet 1200n printer. I want to buy the cartridges for the same. Should I buy Compatible HP LaserJet 1200n toner cartridges (C7115X / HP15)? A. Yes, definitely you can buy the HP Compatible LaserJet 1200n cartridges. These compatible toner cartridges have fine toner particles that aims to produce clear, sharp text and crystal clear images. Also, the cost of these compatible cartridges are 70% less than the original ones. Hence, it makes it an ideal solution for offices that require quality printing. Q. What is the required operating temperature range for HP LaserJet 1200n toner cartridges (C7115X / HP15)? A. The ideal temperature of 59-91F is required for the smooth functioning of these C7115X / HP15 toner cartridges. Q. I have ordered two sets of HP (C7115X / HP15) LaserJet 1200n toner cartridges altogether. Do I need to store one of them at any specific temperature? A. HP LaserJet 1200n toner cartridges (C7115X / HP15) can withstand a temperature between -4 to 104F. You only need to make sure that the cartridges are kept in the mentioned temperature range. Also, it is advisable to keep the cartridges upside down in order to maintain the flow of ink. Q. What is the copier speed that HP LaserJet 1200n printer offers? A. The printer offers you an expected speed of 12 cpm (copy per minute). This is the max speed for black and white copies provided by the HP LaserJet 1200n printer. Q. What media sizes does the printer HP LaserJet 1200n supports? Q. Are these C7115X / HP15 (HP LaserJet 1200n toner cartridges) compatible with my HP LaserJet 1005 printer? Q. Since these HP C7115X / HP15 toner (HP LaserJet 1200n cartridges) are recycled ones, does it makes any difference in the quality of print that it offers? A. Certainly not. The cartridges offers great print quality in a very affordable price. Also, the ink filled in these cartridges is of ISO standards that assures the fine printing.